The Lloyd team recently completed renovations to what is now known as American Family Fields of Phoenix. This Spring Training Facility for the Milwaukee Brewers adds to Lloyd’s portfolio of spring training complexes nationwide. It was an honor to work on the project and the team has really enjoyed seeing this great facility come to life. Thank you Joe Mock with Baseballparks.com for the nice article! The Yellow Jacket crew was recently out installing the main well at Desert Sky Park in Gilbert, Arizona… Read more! Happy Holidays from the Lloyd Team! 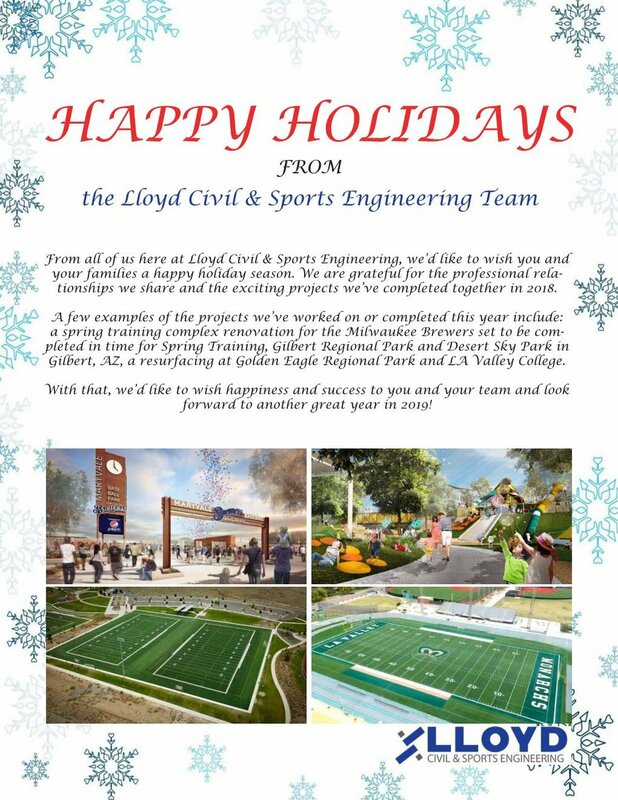 From all of us here at Lloyd Civil & Sports Engineering, we’d like to wish you and your families a happy holiday season. We are grateful for the professional relationships we share and the exciting projects we’ve completed together in 2018.